Daxus acquires, processes and stores all data locally with no need for a PC connection. Users can record just a few signals or hundreds of parameters. Standing at just 4.7˝ tall x 12.8˝ wide (119mm tall x 324mm wide) and weighing just 7 lbs. (3 kg. ), Daxus is compact and tough enough for virtually any environment. As a world leader in the data acquisition and recording market since 1971, Astro-Med’s Test & Measurement group designs and manufactures data acquisition hardware, software, and supplies for the general industrial, aerospace, automotive, defense, metal mill, pulp and paper mill, and transportation markets. Astro-Med, Inc. (NASDAQ:ALOT) is also a leading manufacturer of high tech specialty printing systems and is a member of the Russell Microcap® Index. 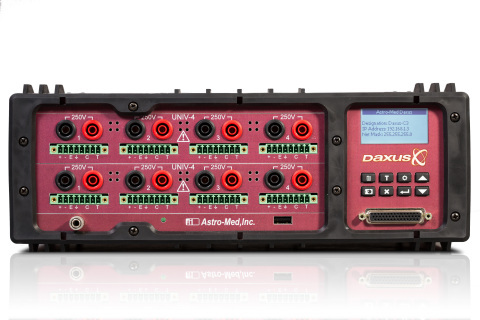 More information about the Daxus is available at www.Astro-Med.com/daxus and by calling 877-867-9783.